« It’s About Time This Site Was Updated! 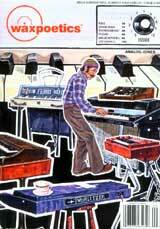 I am pleased to announce that my in-depth article about Zawinul is the cover story of the issue No. 9 of Wax Poetics magazine. If you aren’t hip to Wax Poetics, you should check it out just for this article–one of the longest to published about Joe. It covers Joe’s development as an electronic keyboardist from 1966–when his use of the Wurlitzer electric piano helped transfrom “Mercy, Mercy, Mercy” to a national hit–to his early use of analog synthesizers with Weather Report. The article includes material from new interviews with Zawinul as well as Roger Powell, Brian Risner and Jim Swanson. I know I’m tooting my own horn a bit, but my friend Andy Forward, the most avid Zawinul collector that I know, calls the article “the best (as in well written and well researched) thing I have read about Joe.” You can find Wax Poetics at Tower Records (in the Dance and Techno section), or check the magazine’s web site for purchasing information. All of the previous issues but one are sold out, so don’t delay if you want this. This entry was posted on Sunday, September 12th, 2004 at 11:10 pm and is filed under News. You can follow any responses to this entry through the RSS 2.0 feed. You can leave a response, or trackback from your own site.